Email Data Loss Prevention (DLP) is a part of Exchange Online Compliance Solution. It’s well accepted fact that internal threats are much bigger than external threats, when it comes to Data Leakage. Certain pre-defined rules are configured. 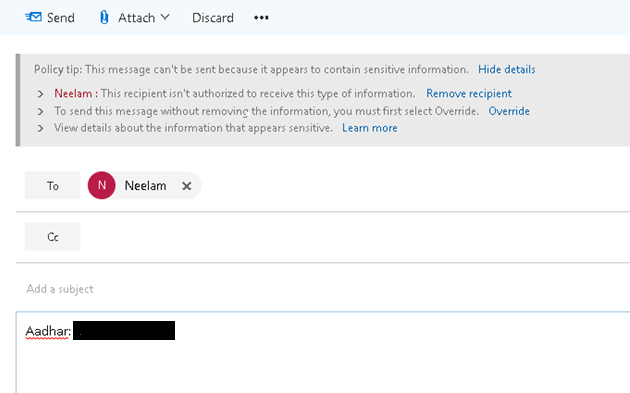 Every outgoing message is evaluated by the DLP against the pre-defined rules to prevent accidental or deliberate data leakage. This is done either by displaying warning or preventing the message from being sent. 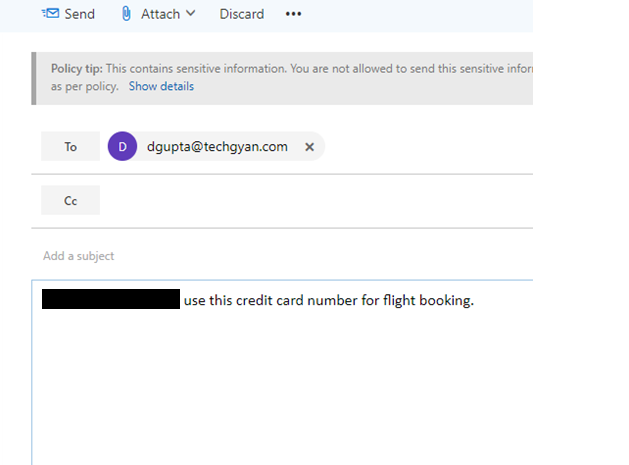 Examples would include Passport number, Credit Card number, License number, etc. 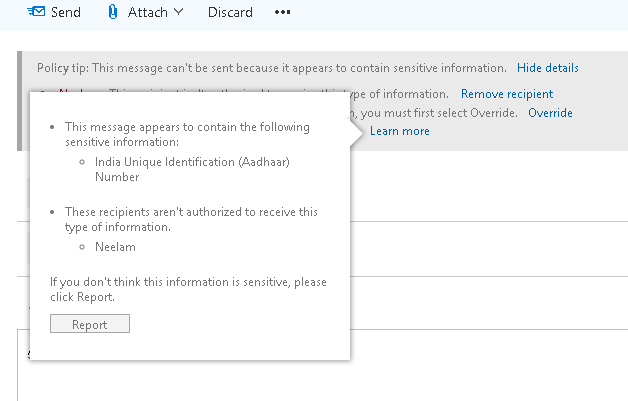 The sensitive information types look for a specific pattern and confirms it by ensuring proper formatting, enforcing check sums, and looking for relevant keywords or other information. 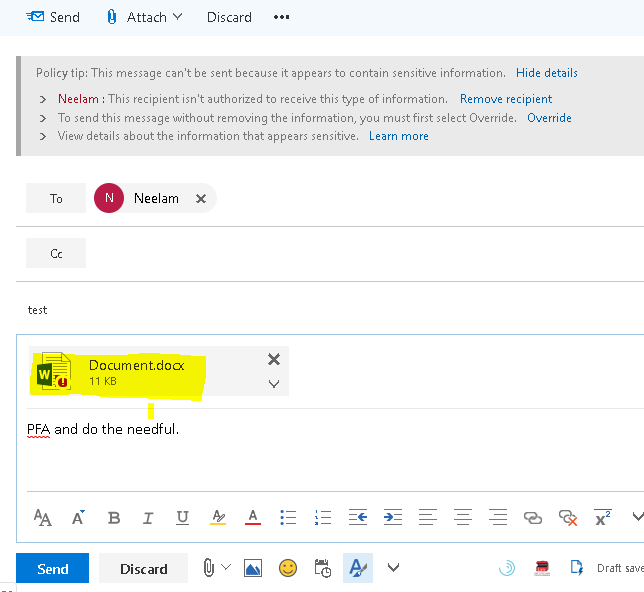 It will detect content that's shared with people outside the organization; Restrict access to the content for external users; also Notify users with email and policy tips. In the snip below, you can see Policy Tip. Note that we have marked out the Actual Aadhar number. We can also override the policy to send the information with specifying business justification. 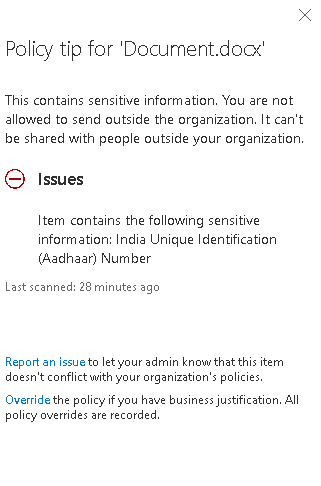 If the information is not sensitive, then we can also report it as false positive by clicking on Report button. 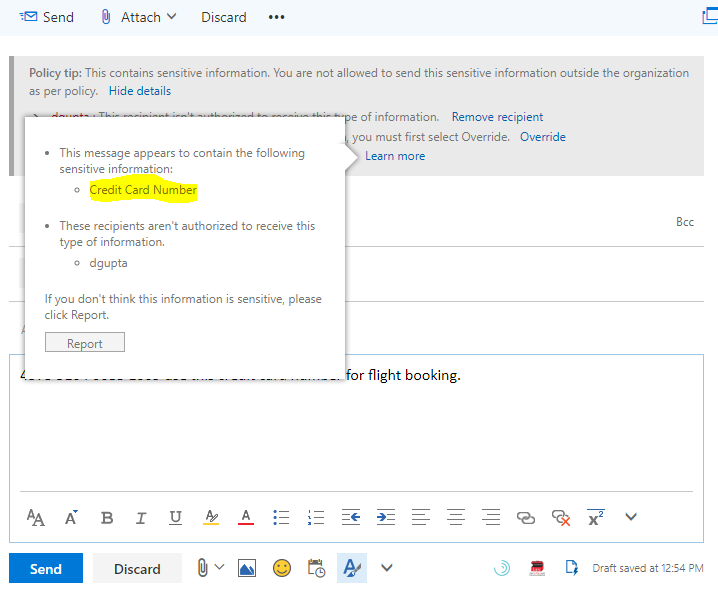 When we open any document containing sensitive information which is saved in SharePoint or OneDrive then also DLP policy detects that and policy tip appears on that. We cannot share such file outside the organization. Thus, Data Loss Prevention(DLP) feature enables Companies to enforce message content rules within their organization. 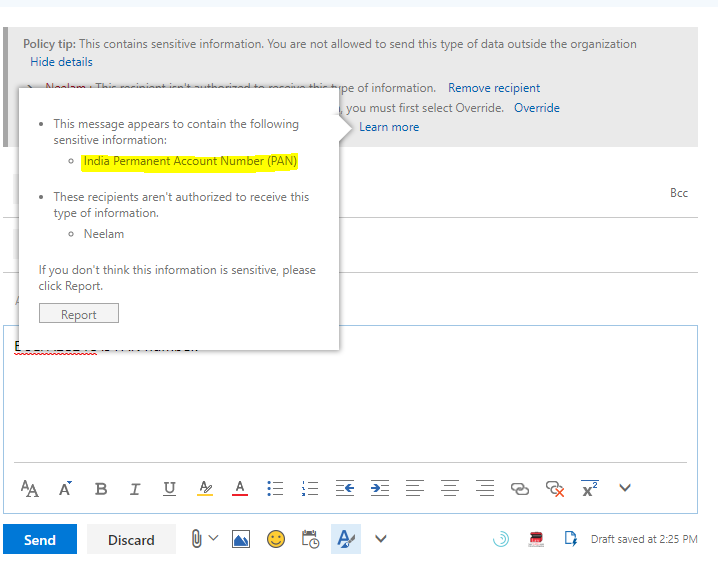 The DLP feature is available in all Office 365 plans which include Exchange P2 plan. To know the different Exchange Online plans, click here . You can also increase the Email Security by deploying our Email and Document Security Solution. For a Comprehensive Productivity and Security Solution , you can consider Microsoft 365. If you wish to discuss how you can implement DLP in your Company, call us on 022-2413 4530.